Located on the slopes of the famed Blue Ridge Mountains of Virginia, LL Red Bud is quiet and secluded on 68 acres. 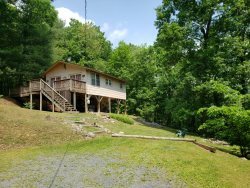 There is a deck with great views, private pond, and private 1-mile hiking trail with gorgeous views. 2 ½ miles from Hawksbill Town Park (swimming, volleyball, etc. ), 2 ½ miles from Wisteria Vineyards, 10 miles from the Town of Luray, 10 ½ miles to Luray caverns,15 miles to the Thornton Gap entrance to the Shenandoah National Park, 25 miles to Massanutten Resort, and 16 miles to the George Washington National Forest Story Book Trail. Hello, I had a fantastic stay at LL Red Bud cabin. It was adorable and cozy. The hot tub was fantastic and everything else was incredibly comfortable. I hope to return for another stay within a few months. This cabin is amazing! It took my breath away. Its perfect. The whole environment is beautiful. The porch and the view is even more amazing than in the pictures. The inside was so clean and so charming it looks so much better in reality. My husband and I had the best time relaxing there. The Jacuzzi was clean and warmed up and ready for us the grill was perfect. we had such an amazing time at this cabin. We went to the private trail to see the outlook it was amazing! It was worth the hike. We hiked in the snow which was pretty nice and scenic. Once again I love this cabin! Defiantly will return again for sure!!! Oh yes, when we needed help figuring out the DVD player someone came so fast. It was good and friendly service. And the drive up there was so beautiful passing huge mountains and getting up to the private property the roads were like a fun ride. Very secluded. Please be advised you have rented a mountainous property. The main and secondary roads are usually paved. However, the driveway is a gravel or hard packed dirt surface. You may experience potholes, ruts, steep inclines, and rough terrain. Most front wheel drive vehicles have no trouble accessing their property from these roads as long as you drive safely and slowly. We do not recommend low profile vehicles such as sports cars or motorcycles. During inclement weather such as snow or ice you may be required to have 4-wheel drive or tire chains. We also recommend Travel Insurance during winter months. We do not give refunds for road conditions that are out of our control.